The Allegro Secure IoT Suite is specifically engineered to meet the rigors of embedded computing while offering manufacturers access to the latest networking and embedded security technology to actively participate in the rapidly growing Internet of everything universe of devices. With 300+ design wins and 250+ million devices shipped to markets worldwide in a broad range of applications, Allegro’s technology is widely recognized as the most used web server on the market today. The full suite of Advanced Edition products support both IPv4 and IPv6 operation, offers TLS 1.2 using FIPS 140-2 level 2 validated cryptography along with a rich set of Web technology, unprecedented flexibility, and unparalleled performance to meet your embedded device development needs. RomPager AE is a sophisticated HyperText Transfer Protocol (HTTP) engine that serves content to browsers and other Web clients. Fully compliant with HTTP 1.1 specifications, the RomPager AE Web server offers superior performance and can be configured to handle thousands of concurrent requests. RomPager AE also provides access to a high-performance CGI-style interface, optional file system support, and the ability to dynamically generate HTML giving your engineering team flexibility to design any Web-based interface of their choice. Additionally, the toolkit offers the ability to serve web objects (HTML, GIF, JPEG, Applets, etc.) from multiple sources: an optional file system, CGI-style User Exit functions, and ROM. RomPager AE is delivered as standard ANSI-C source and built upon a highly portable and field-proven abstraction layer enabling it to work with any RTOS or TCP/IP stack. Delivered as part of the toolkit, the PageBuilder Web-to-C compiler gives your engineering team a powerful and advanced tool that simplifies the process of converting Web objects to ANSI-C structures. The generated source is compiled and later linked with the RomPager AE modules along with your application allowing the Web server to present Web objects directly from ROM. The PageBuilder Web-to-C compiler also offers significant features for compression, integrated variable data access, integrated dynamic content and much more. 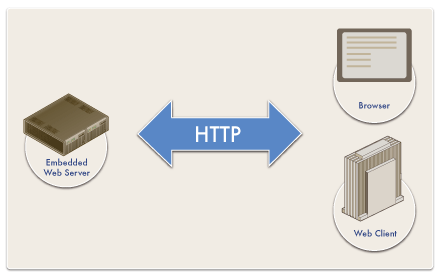 Additionally, the Web server engine itself offers HTTP Streaming and HTTP 1.1 PUT, OPTION and TRACE support. Advanced Security features are included with support for Digest Authentication, external password validation and support for an internal security database with dynamic realm and security level configuration. Additional support is provided for state management (URL and HTTP Cookies) and compliance with IETF standards (RFC 2069, RFC 2616, RFC 2617) along with Browser-based file upload support (RFC 1867). Security is always a concern when dealing with devices connected to the internet. RomSTL addresses the need for advanced security with integrated TLS 1.2 support. With support for a variety of cipher suites (RSA, DHE, RC4, DES, 3DES, AES, SHA, CBC, and MD5) and full integration with Allegro’s FIPS 140-2 validated cryptography and Suite B, your development team can provide compatibility with all standard secure browsers. RomSTL also offers a built-in certificate authority, certificate import support and Basic and Digest Authentication under TLS. 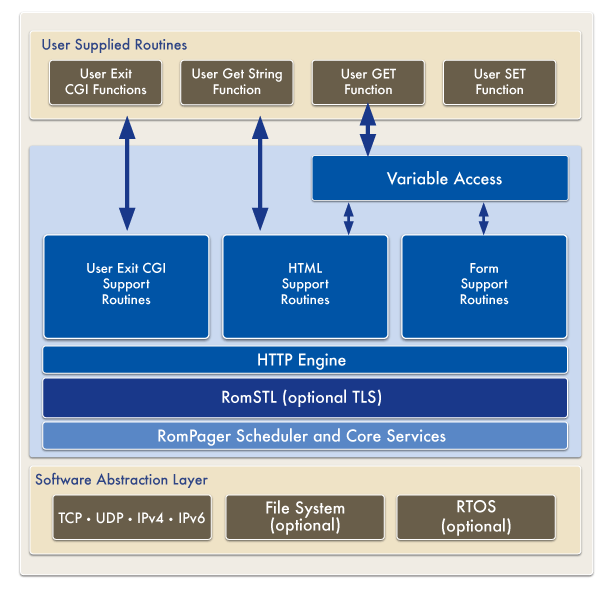 Compliant with IETF standards (RFC 5246 and RFC 3268), RomSTL provides RomPager AE with the advanced security functionality to meet your development team needs. Allegro’s Secure IoT Suite is highly portable across RTOS and processor families. Delivered in ANSI-C source code all products utilize a field-proven abstraction layer to enable portability with any RTOS, TCP/IP stack, and file system environment. Interface files for leading RTOS environments are provided.